May 22, 2004 to May 30, 2004The car was parked for 7 years with the emergency brake on. 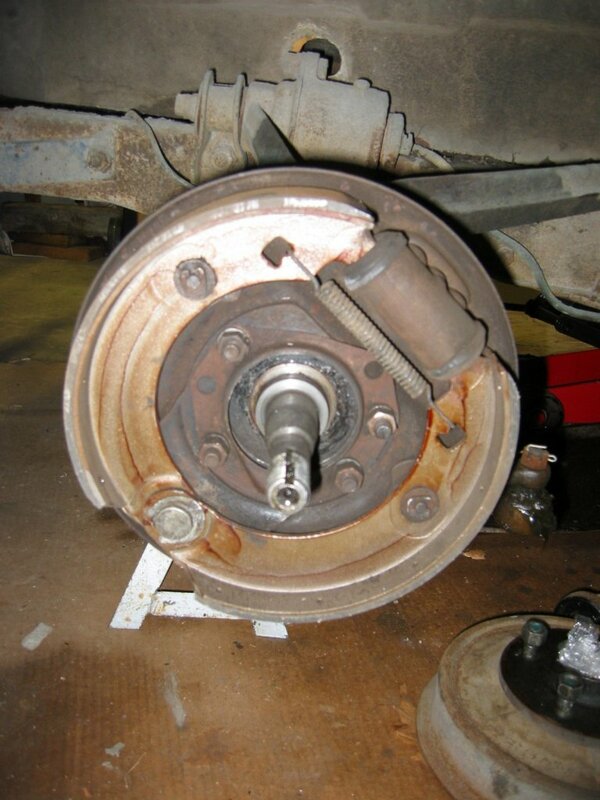 The hydraulic brakes did not work at all and the emergency brake would not release. This make loading and unloading the car from the trailer we towed it home on a little interesting! The emergency brake levers yielded to a little cautious beating so I moved on the the hydraulics. 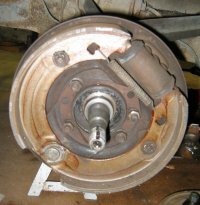 These are Lockheed-Warner 4-wheel hydraulic brakes. Very, very simple by today’s standards but they have worked 63 years so far! They look like new! These were last rebuilt in 1985 but they look like they were installed yesterday. The car is equipped with a device called a “Hill Holder” or “No Rol” that would keep the brakes locked when the car is on an incline as long as the clutch pedal is in. With a little persuasion I removed both the master cylinder and the hill holder. 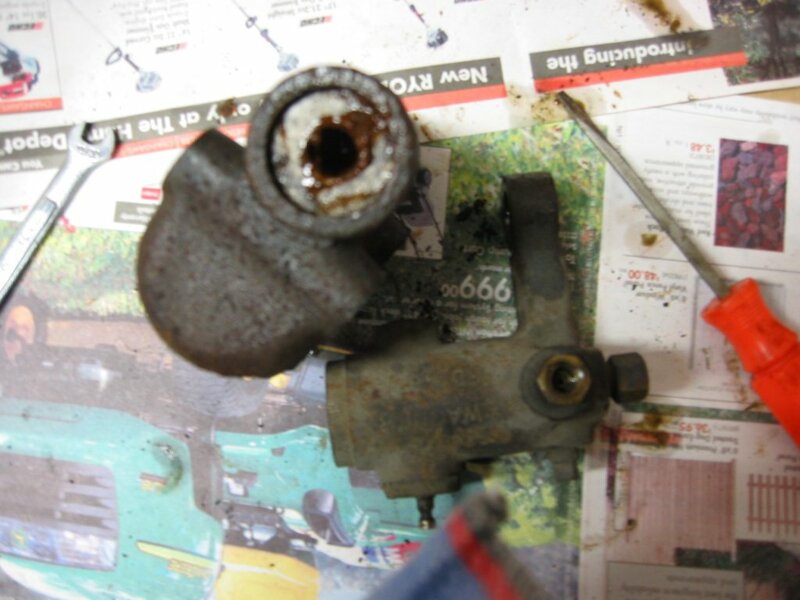 The fuzzy picture at right shows the Hill Holder on the right and the master cylinder oozing rust (!!!) on the left. Here is what the piston looked like when I disassembled the master cylinder. Ouch! This will never do. On a whim I called my local NAPA and asked if they could get the rebuild kit. They had it for me the same day! These guys are good. I rebuilt and painted the master cylinder and flushed out the Hill Holder. I was a little afraid to take the Hill Holder apart and I live in East Flatland, Ohio so I left it alone. I will adjust it so it does not do anything. Here is the final result installed under the car. You can see how the master cylinder feeds into the Hill Holder. 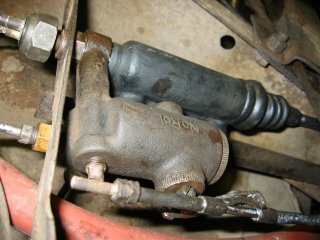 The rod connecting the Hill Holder to the clutch pedal is at the bottom. The brake light switch is also visible in the upper left corner. After bleeding the brakes they seem to be working perfectly. 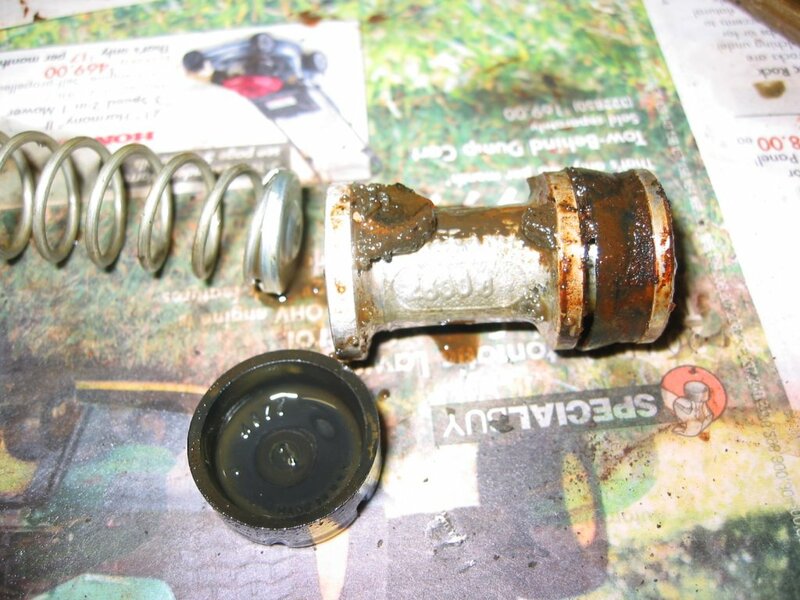 A spring is missing from the emergency brake system but once that is replaced this guy should stop.